Most parents have experienced the “Mommy, I want …” situation while out doing shopping, although these situations can escalate into full blown tantrums or cause you to spend money you do not really have on items such as candy or more toys. There are a variety of ways to overcome these difficult situations, including allowing your children to be a part of the shopping process. Some genuine methods which have been tried and tested are listed in the article on Reddit. The important point to remember is that your children are with you shopping for a reason, whether it is to spend quality time together or because you cannot afford a baby sitter, here are some great ideas on how to include your children into your shopping exercise and curb those embarrassing tantrums. Allow your children to choose some of the items you have to buy, for example if you have to buy vegetables, let them choose between broccoli and beans. Give them pocket money for doing additional chores and make them spend their own money on items they want while out shopping. Let your children fetch items from various departments while you browse the aisles for other items, this speeds up your shopping time and makes them feel important because they are helping you, it also keeps them busy which eliminates the need to beg for treats or throw tantrums. Show an interest in the items that your children look at in the toy department so that you can be prepared for birthdays and Christmas where you want to get them something they actually want. Teaching children to be responsible, making them feel like they are an important part to the shopping exertions and encouraging them to be conscious of what they really want or need instead of expecting rewards for everything they do right will teach them valuable lessons which they will apply repeatedly in adulthood. The above tips are dependent on the age of your children and your preferred parenting style. Each family is different with different circumstances, but each of the tips listed can be molded to suite your circumstances. 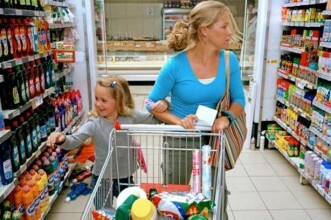 Rewards for good behavior could even be extended to a long term plan with a more expensive or desired item at the end. Incentives are used in everyday life and do not always have to be monetary. You should be able to find at least three ways to curb the tantrums, improve the shopping exercise and teach your children some valuable skills.